Apira Science, which makes a laser helmet system to grow hair, has received FDA marketing clearance for sales to women. The company previously had clearance to sell only to men lRelated Merger speculation drives up Office Depot stock. Apira’s iGrow helmet system uses laser technology to grow hair. Apira said the device promotes hair growth for women who have certain skin types and some baldness. Apira, based in Boca Raton, received FDA clearance for sales to men in 2012. Clearance by the FDA doesn’t mean a product works, only that it’s not harmful. 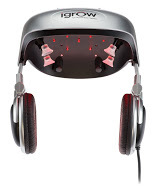 Apira has a patent on its technology, which uses low-level light therapy to re-energize follicle cells. More than 40 million women suffer from genetic hair loss, said Jeff Braile, president of the Medical Products Division at Apira Science. Apira said it conducted double-blind, independent clinical studies to test the efficacy and safety of the iGrow system for women. The studies, published in “Lasers in Surgery in Medicine,” found that women who used iGrow four times a week for 25 minutes a session saw a 37 percent increase in hair growth in four months. The iGrow system, which retails for $695, is sold online at igrowlaser.com and at Nordstrom.com, NeimanMarcus.com, Hammacher.com, Drugstore.com and Frys.com. The product also is sold at select Neiman Marcus, Nordstrom and Fry’s retail locations, the company said. The product competes with another FDA-cleared product developed in Boca Raton, the HairMax Laser Comb by Lexington International, as well as Rogaine and Propecia. Lexington announced just last week that it had received FDA marketing clearance for its “hands-free” HairMax. Apira plans to exhibit its iGrow system at the Consumer Electronics Show form Jan. 6-9 in Las Vegas.